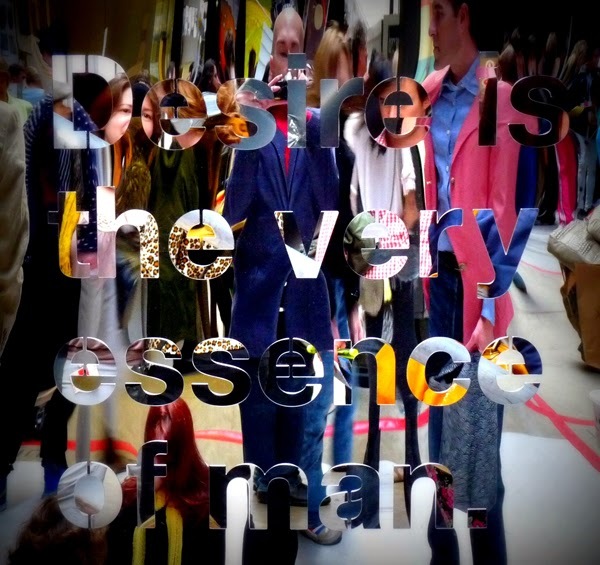 While rummaging through old folders on my computer, I found a photograph of the piece ‘Desire is’ by Irish artist Kathryn Maguire that has enthralled me ever since I took it in May 2010 in London’s Tate Modern. The work consists of the sentence ‘Desire is the very essence of man’ (attributed to seventeenth-century Dutch philosopher Baruch Spinoza and published posthumously in the volume Ethics) that is laser-cut onto a large convex vinyl acrylic mirror. By distorting the reflection of the viewer, the artwork establishes a metaphor about the impact of socially constructed representations of the body in the engendering of self-image and definition of one’s identity.